MiDrive, a U.K. startup that helps you learn to drive with a driving test app and instructor marketplace, has lost Scott Taylor as CEO, after he departed the company last month. He’s been replaced by Asher Ismail, who previously joined miDrive as COO in May 2016. Curiously, the move comes shortly after miDrive has raised £2 million in further funding. The ‘Series A2′ round is led by Initial Capital and actually closed late last year. I also understand it is £1 million less than the startup was seeking to raise as recently as April 2016, according to a pitch deck being passed to potential investors at the time. Confirming Taylor’s departure, Ismail said: “It was Scott’s decision to resign and pursue a new opportunity. He did a great job in leading the business in its early stages. We wish him all the best for the future”. Taylor himself declined to go on record, aside from issuing TechCrunch the following statement: “I left miDrive as my wife accepted a great opportunity in the U.S. Moving to the U.S. has been a long-term goal for both of us. MiDrive has good momentum having just closed its Series A financing. I think they will continue to do well and I wish them every success in the future”. I have no reason to doubt that Taylor — who in January made Forbes’ 30 Under 30 In Technology for Europe list — resigned from miDrive under his own volition. However, the timing of his departure does feel quite haphazard. He officially stepped down as a company Director on 6th of January 2017, according to a regulatory filing, and as CEO on 7th of January, according to Ismail — just two days after Taylor emailed me pitching miDrive’s Series A2 funding news. After answering my initial questions regarding the fund raise, I was met with Taylor’s Out of Office email reply until the 7th of February when I contacted Ismail instead, who informed me that he had taken over as CEO. “The biggest thing to note is that miDrive has come a long way since 2014 but has come even further in the last six to eight months,” said Ismail, when I asked him what has changed since we last covered the company. “As with most startups which are a couple of years old, there comes a point where you have to push the business into the next stage and the company has to ‘grow up’ and kick on — I feel like this is what we’ve been doing since the middle of last year”. The middle of last year — or, specifically, May 2016 — is when Ismail was hired as COO, charged with commercialising and scaling miDrive, which until recently was generating little revenue and making a significant loss. The startup now claims “multiple revenue streams and a multi-million pound run rate”. “I’ve spent a lot of my efforts streamlining the business, making sure we have more of a focus and a clear direction for the next three to five years,” Ismail says. “For us, we had to fundamentally shift away from being ‘just a directory’ to running as a platform with a clear purpose of helping to raise the expectations and standards of the industry”. Those changes mean that where miDrive used to have users, who made use of its driving theory app and instructor directory, it now has customers. “We used to be focused on just matching, now we take ownership of the full learning experience… we operate as a platform for instructors and learners by taking payments and gamifying the entire learning experience”. Meanwhile, miDrive’s founding story and list of backers is interesting. The company began life in 2013 as a spin-out of Holiday Extras when an employee, Matt Sutton, came up with the original driving instructor marketplace idea and presented it to his then boss Simon Hagger. The two developed the concept further, and Hagger pitched it to the Holiday Extras board for some seed funding and a small incubation team was set up to launch and test the concept. Having done so, in early 2014 miDrive raised a £2 million Series A round (which saw Holiday Extras maintaining a majority ownership) and Scott Taylor was brought on as CEO that April. 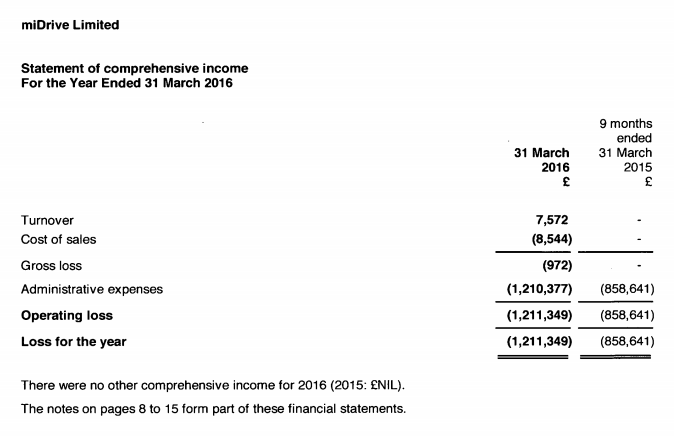 In late 2016, the company closed a further £2 million led by Initial. I understand that both Sutton — who also left miDrive this January! — and Hagger remain minor shareholders. As does Taylor via shares he will have accrued in his role as CEO.